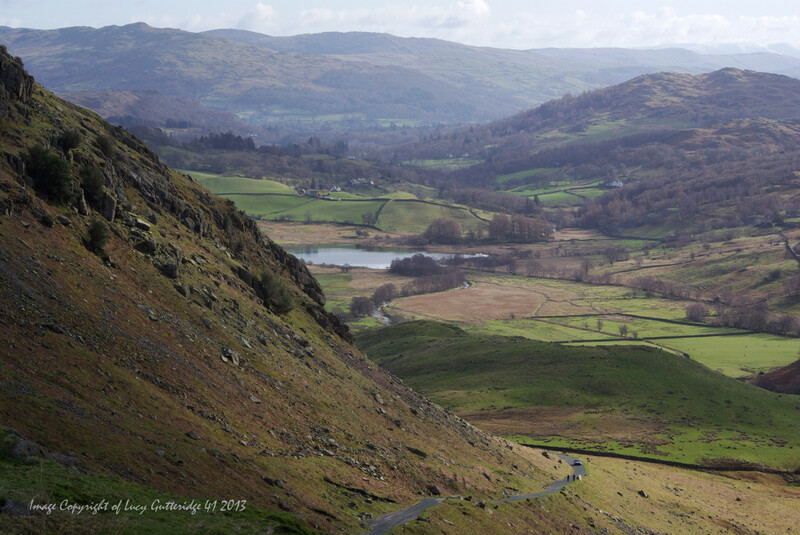 41 Day 252 – View From Hardknott Fort. I wrote recently about my travels across one of the most testing of Lakeland roads, the Hardknott Pass. I could’nt continue my blog without sharing some of the spectacular views that can be enjoyed at it’s highest point of 1289ft, views that would have been seen through the eyes of the Roman soldiers and generals that occupied the fort in the 2nd Century during Hadrians rule. There are substantial walls still remaining and the general layout can be clearly distinguished, from the grain stores that fed the garrisons, the Commanders quarters and the main gate into the Fort. Standing within these walls you feel the atmosphere that lingers, the remoteness of its location, how isolated must those soldiers have felt, far removed from their loved ones and homes far away on warmer shores. The hardship of existence over the seasons, the boredom that must have been mind numbing, military training combined with raw survival, the prospect of battles ahead and a longing for the comforts of loved ones and a Mediterranean summer. Depression and anxiety must have been rife among these men, many of whom never made it home, a road to nowhere for so many, an existence suffered, yet I took my photos, breathed in the air and saw beauty all around. This entry was posted in Uncategorized and tagged Commander, Hardknott Pass, lake district, Lakeland Florida, List of Roman army unit types, Mediterranean Sea, Roman, Wastwater on May 25, 2013 by cottageholidaygroup.